Our coverage includes all important information about today’s releases. It begins with an executive summary that lists the most important information right away. We look at the operating system distribution of patches for all supported client and server versions of Windows, and list all released updates afterward. Check out last month’s overview here. Protection against Lazy Floating Point (FP) State Restore (CVE-2018-3665) for 64-Bit (x64) versions of Windows. Internet Explorer update to conform to the policy that disabled the launch of Developer Tools. Fixed DNS requests disregarding proxy configurations in IE and Edge (copy and paste gone wrong, Edge not available for Windows 7). Fixed DNS requests disregarding proxy configurations in IE and Edge (copy and paste gone wrong, Edge not available for Windows 8.1). Fixed mouse stopped working after switching between local and remote sessions. Fixed form submission issue in IE. Fixed wrong IME mode chosen on an IME-active element. Fixed DNS requests issue where requests disregarded proxy configurations in IE and Edge. Fixed issues with updated time zone information. Fixed wrong IME mode chosen. Fixed form submission issue in Internet Explorer. Fixed DNS requests disregarding proxy configurations in IE and Edge. Addressed updated time zone information issues. Fixed a Google Chrome not working issue on Cobalt devices. Microsoft Edge DevTools Preview app allows debugging of WebView content in UWP apps. Improved Universal CRT Ctype family of functions by correctly handling EOF as valid input. Addresses an issue that may cause the Mitigation Options Group Policy client-side extension to fail during GPO processing. Error message is “Windows failed to apply the MitigationOptions settings. MitigationOptions settings might have its own log file” or “ProcessGPOList: Extension MitigationOptions returned 0xea”. An elevation of privilege vulnerability exists when the Windows kernel fails to properly handle objects in memory. A remote code execution vulnerability exists in the way that the VBScript engine handles objects in memory. A denial of service vulnerability exists in the Windows Domain Name System (DNS) DNSAPI.dll when it fails to properly handle DNS responses. A denial of service vulnerability exists when Windows improperly handles File Transfer Protocol (FTP) connections. An elevation of privilege vulnerability exists in Windows when the Windows kernel-mode driver fails to properly handle objects in memory. A denial of service vulnerability exists when Windows improperly handles objects in memory. Launch devmgmt.msc, device may appear under Other Devices. Select Scan for hardware changes from the Action menu. Alternatively: Right-click on the device and select update. Activate search automatically for updated driver software, or browse my computer for driver software. Localization issues for select strings. The strings may be displayed in English instead of then localized language. Microsoft expects to have a working solution available mid-July. This update makes improvements to ease the upgrade experience to Windows 10, Version 1709. This update makes improvements to ease the upgrade experience to Windows 10, version 1803. KB4022172 — Patches a remote code execution vulnerability in Microsoft Office. KB4022176 — Same as KB4022172. KB4018338 — Security update for Access that resolves vulnerabilities that could allow remote code execution attacks. KB4022221 — Skype for Business 2016 update. Fixes remote code execution vulnerabilities. KB4022218 — Word 2016 update that patches remote code execution vulnerabilities. KB4022188 — Same as KB4022172. KB4022189 — Same as KB4022172. KB4022225 — Skype for Business 2015 update that fixes remote code execution vulnerabilities. KB4022200 — Fixes issues that could lead to remote code execution. KB4022208 — Same as KB4022172. KB4022206 — Same as KB4022172. Security updates for client versions of Windows are provided via the built-in updating system Windows Update. Organizations can make use of Enterprise-specific update tools to download and deploy updates. Updates are also provided as direct downloads on Microsoft’s Update Catalog website. 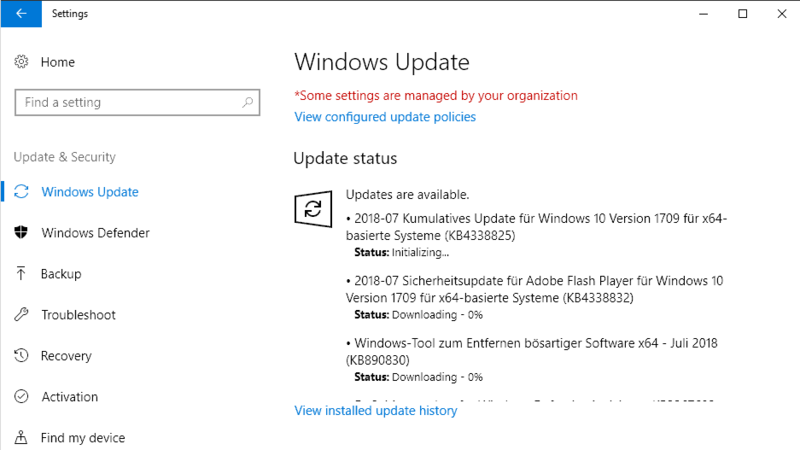 Windows Update, if enabled, checks for new updates regularly but not in real-time. If you want to download and install the new batch of updates directly, do the following to run a manual check for updates (which should pick up the updates). Note: It is highly recommended that you create a backup before you install new updates so that you may restore the system if things go wrong. Click on the “check for updates” button if the update check is not run automatically. Microsoft publishes downloads of all updates that it releases on the company’s Microsoft Download Center website. Microsoft released security and non-security updates for client and server versions of Windows and other products on the July 2018 Patch Day.